I’ve been blogging for almost 5 years now and find myself consistently going through various emotional stages, often on an almost daily basis. I used to be puzzled and frustrated by them. but now I accept and embrace the stages as they seem to be a normal part of blogging for me and possibly are a normal part of the creative process for many people in their field. Panic – I’ve got nothing to write! How am I going to deliver five posts this week, when I can’t even come up with enough content for one? Ecstasy – I’ve got one! This idea could work! Why didn’t I think of this earlier? Quick, start writing! Down to Business – Get those fingers working. Get that first draft done while the idea is still hot. Write, re-write, edit, delete, start again, keep writing, get it done. Self doubt – Almost inevitably, I feel this with every post. Is it OK? Will you like it? Does it make sense? Did I get my message across? Relief – The post is finished and scheduled. I think it’s OK. That’s another night done, another step on the journey taken. And so the cycle starts again. 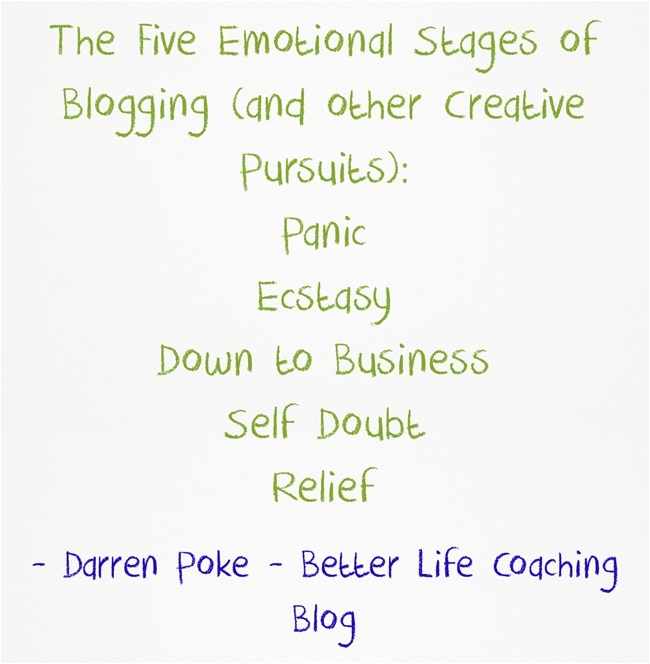 If you’re a blogger, can you relate to these five emotional stages? Do they relate to any other aspect of life? Definitely relatable!! Blogging is a lot of work!